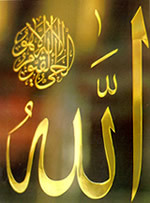 Allah is manifest by being Powerful over everything, manifest to mental proofs. All existing things in heavens and on earth, organisms, celestial bodies, the described and the description, cause and effect bear witness to their need of the Originator Who ordains, originates and endows His creatures with their special traits and characteristics; He, the MANIFEST, said, “On the earth are Signs for those of assured Faith, as also in yourselves, will ye not then see?” (ZARIYAT, 20, 21). Stars attest to His Glory every time they rise and set. All the living beings asserted His Grace in providing them with their sustenance. The whole universe, with its most minute details is but a sign and manifestation of Allah’s names and attributes. Allah is the IMMANENT Who is veiled from the perception of sights, concealed from the perception of mentalities and minds. He isthe IMMANENT, Who is too exalted from the perception of senses and thetreasure of fancy; He is different from all that occurs to our mentalities. Allah, Praise and Glory be to Him, is MANIFEST throughintellectual faculties, IMMANENT to senses and fancy; He is the MANIFESTas far as definition is concerned and He is the IMMANENT as far as modalityis concerned. Glory be to Allah, Who veiled Himself from His creatures by His Light, and Who is hidden from them despite His overwhelming Presence. He is the MANIFEST and nothing is more manifest than Him, and He is IMMANENT and nothing is more IMMANENT than Him; He is the First and the Last, and of all things He has perfect Knowledge, Praise and Glory be to Him, He is Allah. «(73) The FIRST (AL-AWWAL) (74) The LAST (AL-AKHIR..